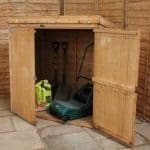 This 8 x 6 overlap apex sustainable shed is a wonderfully compact but useful unit. 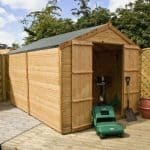 It should look good in any garden and it has a number of aspects that make it a real find for anyone who wants a good and straightforward shed. The overlap aspect is the key thing here and it offers protection alongside the apex roof against rain, as well as providing stability within the structure. It also helps to keep the initial cost of the shed down, making it an affordable choice. The shed also has styrene-glazed windows which is actually safer and tougher than glass. This gives excellent peace of mind if you have young, accident-prone children. It also ensures that the shed benefits from natural lighting. One of the main features of the building is the fact it is Sustainable Homes Code Compliant. Regular homeowners don’t necessarily need to worry about this feature. However, it is extremely beneficial for property developers. It basically means that the building has been constructed with environmentally friendly materials. It will require annual treatments to make sure it is constantly resistant to the elements. 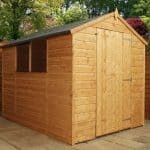 However, even with this added cost, the shed is still really affordable compared to a lot of other similar sized storage sheds. 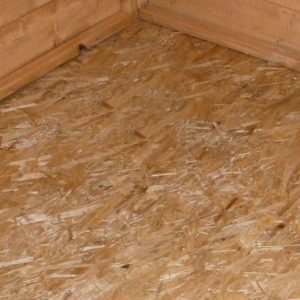 Needs annual treatments, though this isn’t unusual for wooden buildings and it ensures you get the 10 year anti-rot warranty. Not painted – This is a feature that may put you off, though you do have the option to change its appearance via coloured treatments. Prone to warping if built in a sunny spot. However, regular treatments will help to prevent this from becoming an issue. 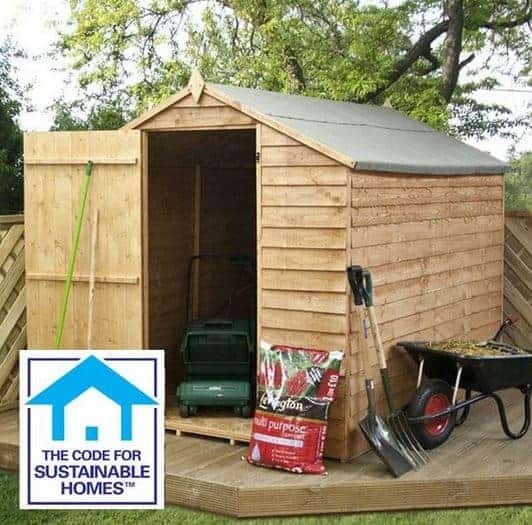 This is a mid-size Sustainable Homes Code Compliant wooden storage shed. Offering a water-resistant apex roof, the shed benefits from year-round weather protection. The interior of the building also gains more head room thanks to the shape of the apex roof, making it a good option for those looking to store tall equipment such as ladders, as well as tall people looking for a more comfortable space to move around in. The roof is also covered with heavy duty sand felt for more weatherproof protection. The roof and eaves measure 1.98m and 1.51 tall. This is slightly larger than what you will find on similar sized sheds. Their height is one of the main benefits of this building. 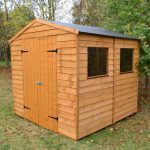 At 1.79m wide and 2.37m deep, the shed is also a good size to fit in most gardens. The door measures 0.90m wide and 1.64m tall, also providing a good deal of space to transfer your storage in and out of the building. In order to keep the costs of the shed down, Waltons have created this model with overlap cladding. 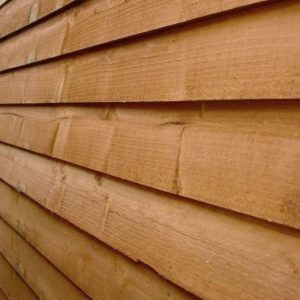 It’s worth noting that this type of cladding may be the cheapest available, but it is still reliable and durable provided you treat it right. The majority of sheds use 8mm thick overlap sawn-timber cladding and the boards are nailed down on top of each other, creating the overlap feature. You’ll notice it’s actually a very similar design to the type of construction you see on garden fences. The overlap feature creates a tight water seal, helping to prevent damage from rainwater throughout the year. One disadvantage that isn’t made very clear when it comes to overlap wooden buildings is that they are more prone to warping. This is especially true if you build the shed in a sunny part of the garden. So this is definitely something you need to be aware of before you assemble it. The frame of the shed is built with 28mm x 28mm materials, which is actually the same as many Shiplap and tongue and groove designed sheds. It offers a sturdy and reliable support for the structure of the building. One thing we should point out is that whilst there is a floor included with this shed, it isn’t overly strong. 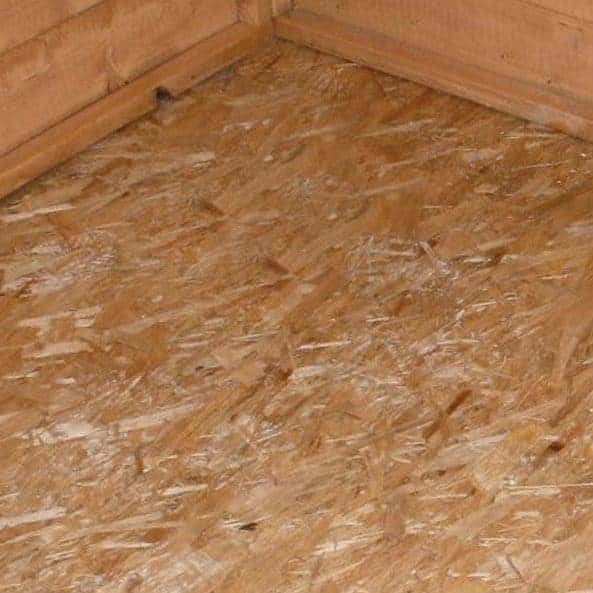 Made from 10mm solid sheet boards, the floor will be able to withstand light and medium weight items. However, if you’re hoping to store a heavy lawnmower or heavy boxes, you will definitely need to upgrade the floor with an extra strength support pack. One of the downsides to overlap cladding is that it doesn’t provide natural water-resistance. 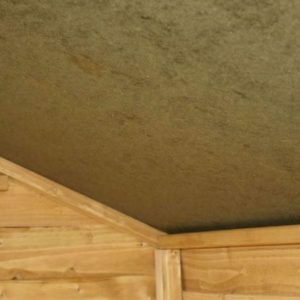 In order to ensure you are getting a reliable and weatherproof shed, you will need to treat it with a high quality preservative every single year. Like other cladding types, it’s recommended you treat overlap buildings with spirit based treatments. This is even more important on overlap buildings due to the fact that it isn’t as strong as other cladding types. The spirit treatment will penetrate down into the inner levels of the timber, helping to provide a much stronger level of water resistance. You can use a water based treatment, but they do require more regular top-ups than spirit based ones. However, the water based treatments come in a much wider colour choice so if you aren’t a fan of the unpainted design, the Cuprinol water based treatments are worth looking into. An anti-rot warranty does come with this shed, but it does need to be treated before it can be applied. It covers the building for 10 years so considering overlap cladding isn’t as strong as other types, it’s good to see this model still comes with a long-term warranty. 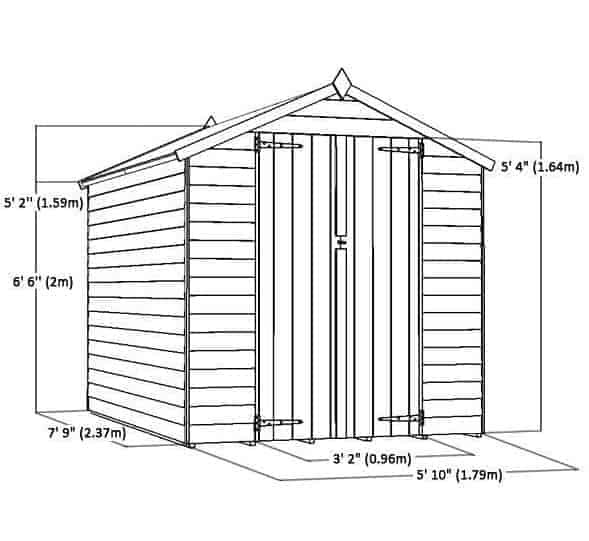 The shed comes with a single door as standard and it benefits from a sturdy, strong design. Offering a good amount of space to easily transport tools and equipment, this door also benefits from a standard Rim lock. The windows provided have been coated with styrene, a great alternative to glass. It is considered 100% shatterproof, making them safer than glass if you have young children. They are also harder to break through which adds to the security of the building. The glazing measures 2.5mm, helping to limit noise pollution and also keep the heat in during winter months. As a general rule, overlap is the least secure type of cladding used on outdoor buildings. You’ll find that while it is pretty good against water damage, the material itself isn’t very thick. This means if somebody is determined to break in, they won’t find it as difficult to break through the walls of the shed, than they would with a Shiplap or tongue and groove clad building. 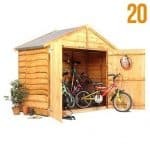 The door of the shed does offer some protection against theft thanks to the standard Rim lock included. This lock could be upgraded too if you want to create a more secure building. If you choose the standard edition of the shed, it also comes with windows. This means whatever you store will be able to be seen from the outside. It also leaves you no privacy to work if you decide to use it as a small workshop. These things do need to be taken into account – particularly if the shed is easy to see from outside of the garden. If you like to have options in terms of customisation, you’ll love this shed. It comes with a fantastic range of customisation options including the ability to upgrade the lock, windows, doors, floor and roofing felt. Above we’ve mentioned the things that the shed comes with as standard. However, we really like the fact that you can change the design of the shed if you don’t like a particular aspect of it. You will need to contact the company in order to make most of these changes, but it gives you a lot of flexibility and the chance to make the building perfect for your needs. Firstly let’s talk about the door and window alterations. If you’re unsure whether the single door will give you enough access space, you have the option to choose a double door design instead. 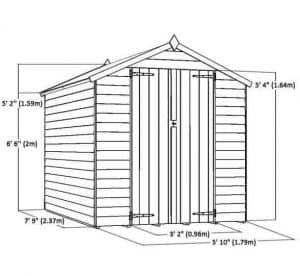 Keep in mind that due to the medium size of the shed, double doors will take up the majority of space on the front of the building. However, they will also give you much easier access. In terms of windows, the ones included do provide a good level of natural lighting. However, they also compromise the privacy of the building. If privacy is important you can request a windowless building instead. Another fantastic customisation option is the chance to choose the type of lock you’d prefer. The company has a wide range of locking systems available so you can potentially make it as secure as you need to. The standard Rim lock does provide a good level of protection so this isn’t a necessary upgrade. However, we still like the fact that you have a choice. Out of all of the customisation options available, the extra floor support pack is the one we recommend. As mentioned earlier, the floor isn’t overly strong. Even if you aren’t planning on storing anything really heavy, we still feel the extra strength support back is a worthwhile upgrade. It just helps to give you peace of mind and also improves the strength of the building. There’s also a good range of extras available. Out of these we recommend the Waltons 8×6 Portabase. 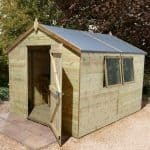 It not only ensures you are assembling the shed on a flat surface, but it also increases the stability of the building, as well as lifting it further off the floor; helping to add to its rot-resistance. The quality that has gone into constructing this shed is brilliant. The one thing you can never fault Waltons for is quality. Whilst 6/10 isn’t a bad score, compared to a lot of the competition the longevity of materials could be better. Overlap cladding is reliable, but it’s less durable than other types. It also requires annual treatments in order to maintain its advertised 10 year longevity. As this is a medium sized building, it does offer a good amount of space. However, compared to tongue and groove and Shiplap models, it doesn’t offer the same amount of storage potential. This is because the cladding will not support hooks or shelving. We do like that this shed is easy to put together. We also find the instructions provided by the manufacturer to be well detailed and easy to follow. However, it’s important to note that it will take at least a day to assemble and some of the panels can be heavy. This shed has been built with affordability firmly in mind. The overlap cladding feature does bring the initial cost down quite a lot compared to other cladding types. However, you do need to factor in the costs of upgrading the floor if needed and also the regular treatments required to ensure the longevity of the building. Final Thoughts: On the whole we do like this shed. It is affordable; especially if you find the solid sheet floor strong enough to hold your storage. It also offers a good level of storage space. However, we do recommend investing in a good lock and you also need to remember you cannot install shelving on the interior walls. So this does limit the amount of storage space available compared to sheds built with other cladding types. If you only have general gardening equipment and tools to store then this won’t be an issue. There’s also the fact that it is Sustainable Homes Code Compliant which makes it a fantastic choice for property developers.